The current financial turmoil is confronting emerging market economies (EMEs) with two shocks—a “sudden stop” of capital inflows resulting from the global deleveraging process and a collapse in export demand associated with the global recession. 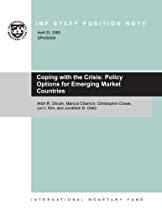 This paper discusses the main policy options for EMEs confronted by these shocks, recognizing that specific prescriptions must be tailored to individual country circumstances. The paper also outlines measures to ameliorate debt overhang and macroeconomic policies to bring about recovery.